an enemys use of those seas important to our operations. The Navys job goes hand in hand with the national interest and the objectives of the rest of the U.S. armed forces. Title 10 of the U.S. Code states that the Navy is to be prepared to conduct prompt and sustained combat operations in support of the national interest. That means we must assure continued maritime superiority for the United States. We must be able to totally defeat any threat to the continued free use of the high seas by the United States. Therefore, we must maintain the ability to destroy hostile aircraft, surface ships, and submarines that threaten our seaborne forces and those of our allies. The national strategy determines the Navys mission. We carry out that mission in joint coordination with the other armed forces and in combined planning with U.S. allies. In carrying out that mission, the Navy has two major functionssea control and power projection. THE FUNCTIONS OF THE U.S. NAVY Sea control, total control of the seas for the free movement of all, is the first function of the U.S. Navy. It means control of set air, surface, and subsurface areas, when and where needed. Sea control is crucial to national strategy. It allows us to use the oceans as barriers for defense and as avenues to extend our influences overseas. Power projection is the second function of the Navy. It is the ability to use sea power throughout the world in the timely and precise manner needed to accomplish a given goal. This covers a wide area. We accomplish power projection by using a broad spectrum of offensive naval operations. These operations include the tactical employment of carrier-based aircraft and the use of amphibious forces and naval gunfire support forces. They also include the strategic nuclear response by the fleet ballistic missile forces. The functions of sea control and power projection are closely related. Depending on the type of force we are to use, we need some degree of sea control in the sea areas from which we are to project power. The United States developed the naval forces capability to project power largely as one means of achieving or supporting control of the seas. To carry out the functions of sea control and power projection in support of its mission, the U.S. Navy has three functions. 20-7 Student Notes: Figure 20-3.U.S. 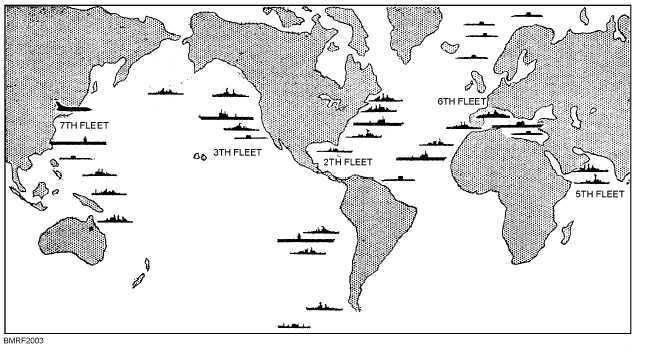 naval presence throughout the world.